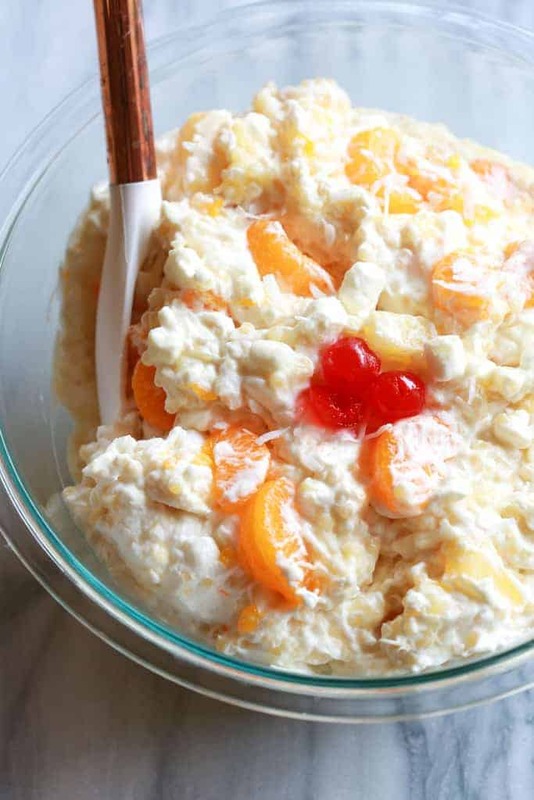 Everyone always loves this creamy, fluffy Frog Eye Salad made with acini de pepe, pineapple, coconut, mandarin oranges, marshmallows, and bananas. I’m sure many of you know this salad as the one that your grandmother brought to family parties. It’s super old school, but some of those old school recipes will always be classics, am I right?! But, can we all agree that “Frog Eye Salad” is the worst name ever? It totally makes me laugh. The last thing I want to be thinking when I’m eating this is “ooh, those acini de pepes are just like little frog eyes!”. I don’t know who came up with the name but it’s so weird. Did you grow up calling this “Frog Eye” Salad or something else? We usually called it Acini de Pepe Fruit Salad. The traditional version of this salad uses a container of thawed cool whip, but I use freshly whipped cream instead and it makes the biggest difference. Beating the cream takes just as much time as thawing a container of cool whip, but it tastes SOO much yummier! 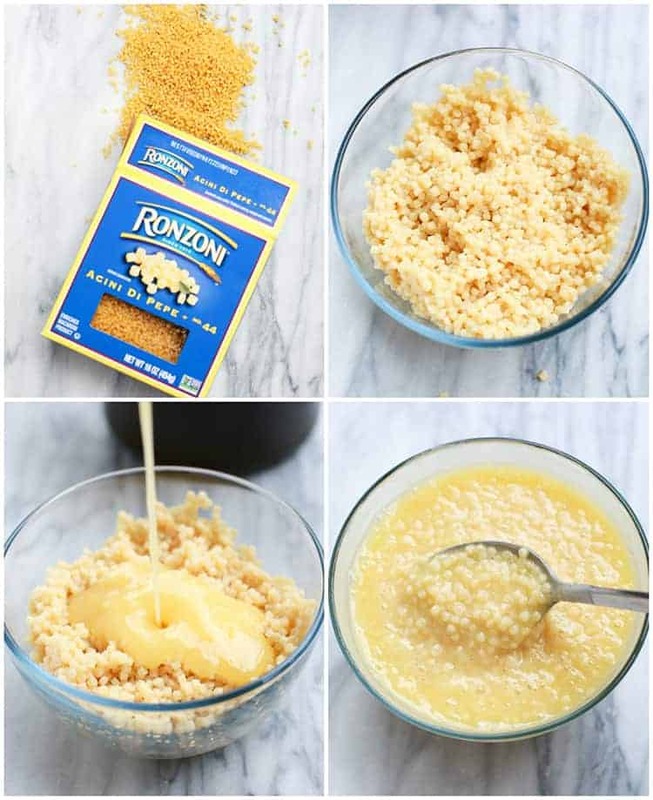 In a saucepan, heat sugar, pineapple juice, egg yolk, salt, and cornstarch and whisk until combined. Bring the mixture to a boil and wait for it to thicken slightly. Remove it from heat. Cook the acini de pepe noodles separately. Combine the acini de pepe and the sugar mixture and refrigerate overnight or for at least two hours. 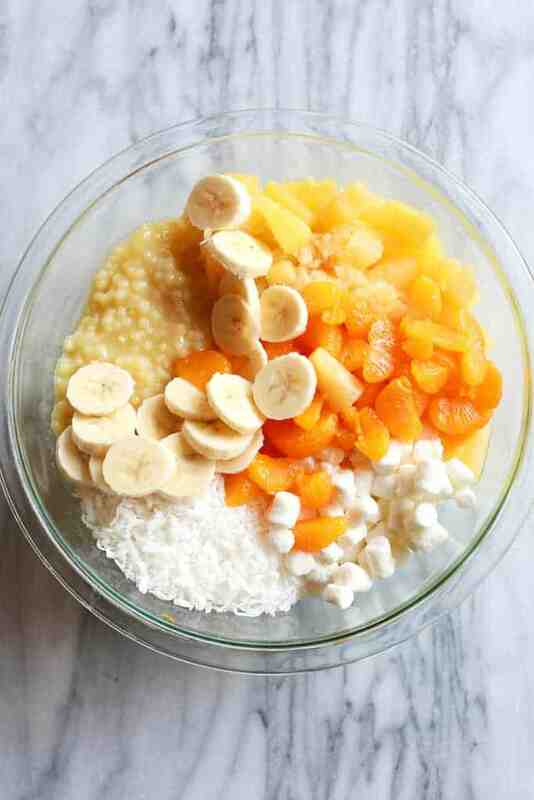 When you’re ready to serve the salad, combine the pineapple, oranges, coconut, bananas, and marshmallows. Then add the fruit mixture to the acini de pepe noodles. Fold in the fresh whipped cream and serve! How do you cook acini de pepe noodles? Bring a pot of water to a boil. Add the acini de pepe noodles, lower the heat to a simmer and cook for about 6 minutes or until al dente. Creamy, fluffy, homemade Frog Eye Salad with acini de pepe, pineapple, coconut, mandarin oranges, marshmallows, and bananas. Drain the pineapple cans and reserve the juice. Reserve the pineapple fruit in the fridge for later. In a saucepan over medium heat combine the pineapple juice, sugar, egg yolk, salt and cornstarch and whisk until smooth. Cook until mixtures comes to a low boil and thickens slightly. Remove from heat and allow to cool. Cook acini de pepe noodles according to package instructions. Drain and cool. Combine the acini de pepe and the thickened sauce in a tupperware. Refrigerate for a few hours or overnight. 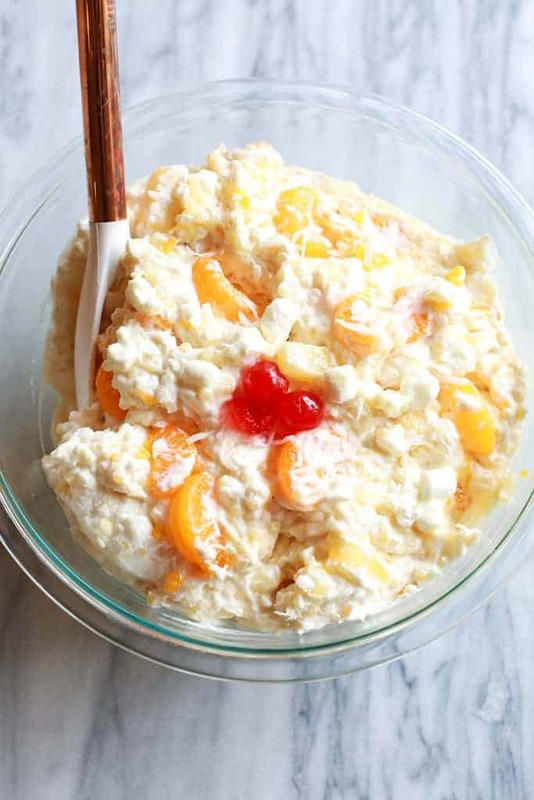 Once the acini de pepe mixture has chilled add it to a large bowl with the pineapple, mandarin oranges, coconut, marshmallows, and bananas. In a separate bowl beat the cream and sugar together until stiff peaks. Fold fresh whipped cream into the acini de pepe mixture. Serve immediately or refrigerate. This was so easy to make and everyone loved it! We will be making it again for both Thanksgiving and Christmas this year! I remember my grandmother making this when I was younger. 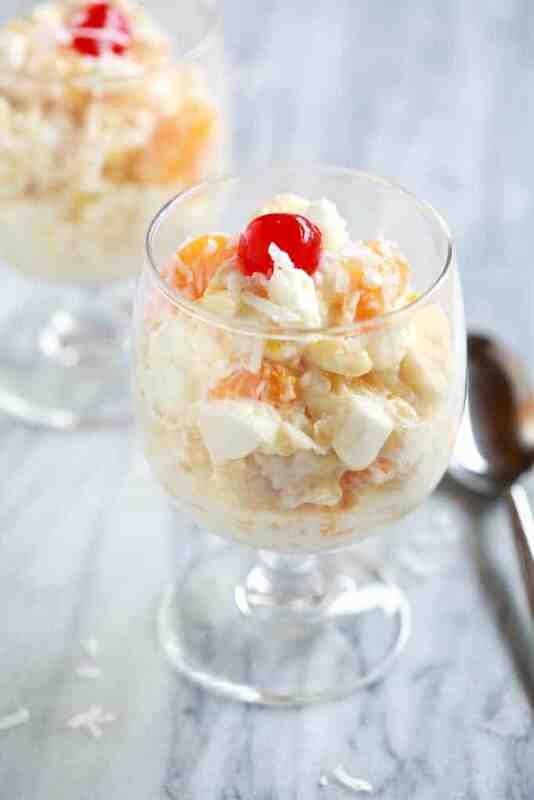 Your recipe is delish and I will definitely be making this again! So much better than what I’ve made in the past with instant pudding. Thanks for the recipe! We loved it. 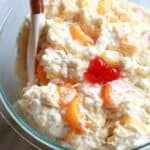 My granddaughter loves frogs and turtles and bugs so when you posted this recipe I thought I would make it because of the name. I had no idea it would be such a hit! Everyone loved it and loved the name and now it will be a staple at our celebrations. Thank you so much for making our Thanksgiving extra special this year. We’re still talking about Frog Eye Salad. ?❤️? Where can you purchase the acini de pepe noodles? I’ve gone to two of my favorite grocery stores and couldn’t find them. That’s strange–my local grocery stores carry them….even Walmart. You could always buy them online…Amazon for example. Good luck! if you use bananas then it won’t last as long. Best to leave them out.